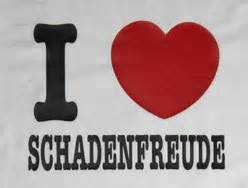 What are Schadenfreudicans you ask? Thereby hangs a brief tale. Back to the future. Nixon and his fellow Republicans decided that the best way to win elections was through something called the Southern Strategy. This amounted to playing on the fears of Southern whites about blacks. It was a racist strategy. Enter Donald Trump. The man who says what many in the GOP have come to believe. The problem is that the country has changed since the Southern Strategy was first launched. There are too many brown and black people, working women, Asians, etc. And more and more of these folks are voting. Now the poor GOP establishment is sweating. Trump could win the nomination. Or mini-Trump, Ted Cruz, could win. Both disasters waiting to happen for the general election. The GOP leadership deserves any stress or suffering that they may be experiencing for their past and continuing behavior. Those of us who realize the damage that their Southern and similar strategies have done to our system are warranted in feeling some Schadenfreude, some pleasure at their misery. The Republican leaders have become for us the gloriously unfortunate. They are the Schadenfreudicans. Now you know what’s more fun than a barrel of monkeys.